The court’s version also splits fewer counties than the proposals it received in the past 10 days from Gov. 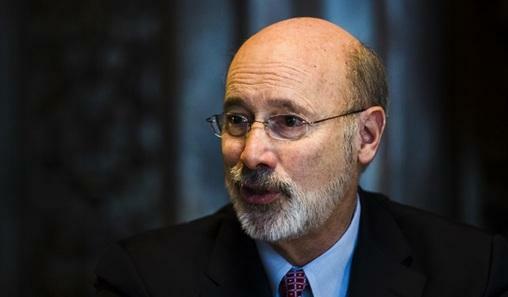 Tom Wolf, GOP leaders, House and Senate Democrats. Minutes after the map was released, political analysts began weighing in on social media. 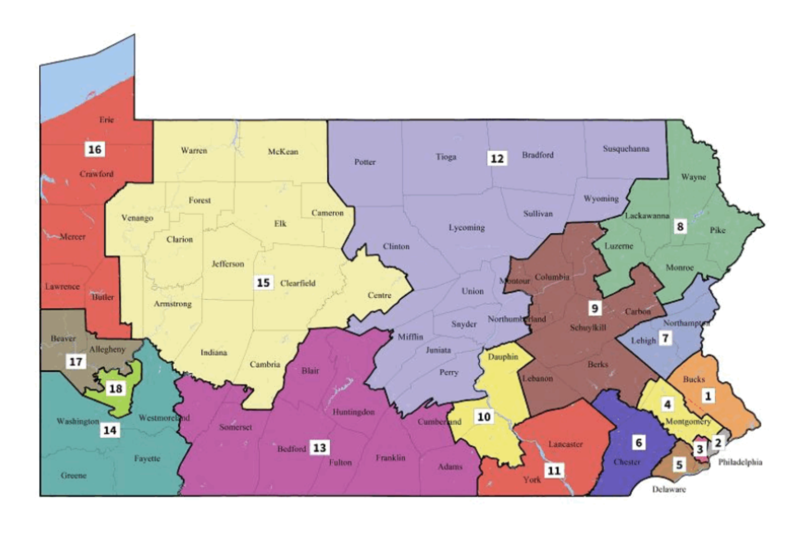 Since the 2011 map was adopted, Republicans have held a 13-5 advantage in Pennsylvania’s congressional delegation. The new map of Pennsylvania Congressional districts, released February 19 by the PA Supreme Court. In their original ruling, the justices gave the GOP-controlled legislature and Wolf, a Democrat, a tight timeframe to reach consensus on a new map through legislation. When that did not occur, the court proceeded to draw its own map with the help of an outside expert. Top Statehouse Republicans have pledged to challenge the judicially enacted map, which they say amounts to an unconstitutional overreach by the Democratic-majority court. They’ve already made unsuccessful attempts to prevent redrawing the map, including a stay request to the U.S. Supreme Court and a claim that two justices’ alleged biases should render case rulings moot. They’ve also complained that because the Jan. 22 three-page order lacked detail on what justices would consider constitutional, it made an already unrealistic timeline for a collaborative map completely untenable. The ruling gives the Secretary of the Commonwealth until Tuesday to raise any logistical issues with the map related to election scheduling. The new map dramatically changes how many of the districts are numbered. And many of the geographic groupings have been significantly altered. For example: Lancaster County and southern York County are now joined as the 11th District. Before, all of York and parts of Cumberland and Adams counties made up the 4th, while Lancaster nearly exclusively constituted the 16th. The city of Reading, previously attached to the 16th by a narrow band of Berks County, is now connected to Chester County in the 6th District. The Lehigh Valley is now its own district, the 7th, made up of the entirety of Lehigh and Northampton counties. Those were split previously with some areas included in the 15th with parts of Berks, Lebanon and Dauphin. Lebanon and Berks are now entirely in the 9th District, along with much of the southern part of Pennsylvania’s coal region. All of Dauphin County is now in the 10th with parts of York and Cumberland counties. The City of Philadelphia now holds just two congressional seats, one completely within city boundaries. Previously, parts of the city were included in three different districts that each also covered parts of the suburbs. Allegheny County is now basically split in half, with Pittsburgh and southern Allegheny together as the 18th and the north combined with Beaver and northern Washington counties to form the 17th. This area previously was carved up into three districts that were far less compact and incorporated pieces of four additional counties. Erie was split before between the 3rd and 5th Districts — but now, the entire county is part of the 16th along with Butler, Lawrence and Mercer counties. Meanwhile, a third of congressional seats are up for grabs in this year’s midterm elections. 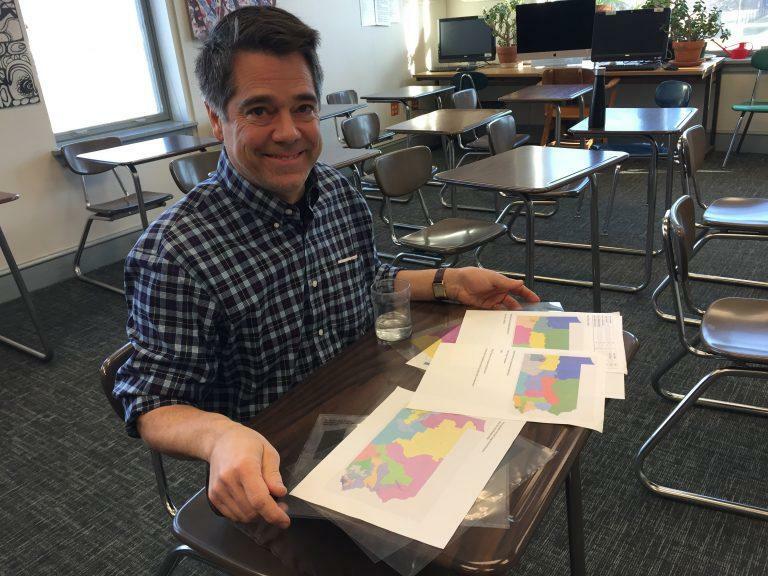 And the map saga has played out at a time when candidates normally would be ramping up campaigns, securing key endorsements and circulating their nominating petitions. But due to the confusion, state elections officials have delayed the start of petition circulation until Feb. 27 and bumped other key filing deadlines. Candidates, meanwhile, have been in limbo, waiting to find out whether they’ll end up in a district different from the one where some had already invested months of campaign work.